Sitting down all day, consuming an unhealthy diet, or a lack of exercise can give way to serious issues in the future. 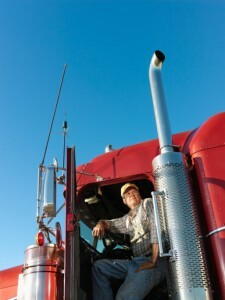 The trucking lifestyle has many benefits, but you’ll also run into some negative effects, or challenges. Luckily, these challenges can be mitigated. Sitting down all day, consuming an unhealthy diet, or a lack of exercise can give way to serious issues in the future. The best way to overcome the issue of constantly sitting through a long drive is by following these tips! Look, sitting down all day is not ideal. Whether you’re married to the cube life or in the trucking industry, sitting down all day just doesn’t feel good at a certain point, and that’s because it’s actually unhealthy. A lifestyle that doesn’t involve any physical activity can lead to chronic issues and even disease conditions, such as obesity and sleep apnea. Truck drivers are in a risky position with these problems, because they clearly sit all day while driving between destinations. Not only that, but they can’t simply get up to walk around either. An easy way to make yourself feel better is by adjusting your posture. A lot of drivers have a tendency to slump, which is natural. Being cognizant of your posture is a simple trick to help you during the long periods of driving. The vibrations and bumps you feel while driving can lead to additional strains as well. A small DIY tip is to place a small rolled up towel beneath your back for additional support. Finally, stretching out is the clearest way to cure any possible repercussions from sitting all day. Whether it’s neck stretches, back stretches or shoulder stretches, they’ll all be beneficial. The more strength you have in these areas, the more soreness you’ll be able to withstand. This entry was posted on Friday, October 13th, 2017	at 3:24 pm	and is filed under Trucking Lifestyle	. You can follow any responses to this entry through the RSS 2.0	feed. Both comments and pings are currently closed.